Sometimes an RV is bigger than a house. Rob and Susanna’s RV before they left Denver for good. I’ve become fascinated with people who actually make major life changes after 40. It’s expected that in our twenties and thirties that we might move to a new city, start a new career, or commit to a life-long relationship. But people who manage to make those kinds of changes later in life seem braver than the rest of us. As we get older, and collect the life baggage we call kids, mortgages and careers, it becomes harder to consider big changes, let alone actually make them. Stability becomes a kind of shield against the world’s ills, encouraging us to do whatever we can to make sure things stay the same. So, recently I interviewed three friends who’ve made major life changes to learn why and how they did them. Rob, who convinced his wife to sell their suburban Denver home and trade it in for an RV and a year of driving around the United States. Sandra, who created a plan five years ago to retire early, and recently left her lucrative civil engineering job in Chicago to retire at age 50. And Ruth, who, despite a passel of kids in Western Massachusetts and friends around the world she loves, decided to stop using Facebook. Rob, Sandra and Ruth each made changes I’m not sure I could undergo. But each person says they feel secure and happy with their choice and can’t imagine doing anything different. Until last month Rob and his wife Susanna lived in a 4,000 square foot house outside Denver, with a view of the mountains. Rob was an urban planner in Thornton, Colorado, while Susanna managed a federal grant program. They lived in a friendly community, and their five-year old son, Rafe, was happy. But something just didn’t seem right for either Rob or Susanna. “We started thinking from a materialism point of view. Why do we need all this stuff?” said Rob. Filling a big house with possessions, climbing the career ladder, and living far away from family (Rob’s parents live in far-upstate New York, while Susanna’s live in New Mexico) was just not fulfilling. Sitting outside with a friend one day, Rob realized, he wanted to leave Denver. And then talking about it later with Susanna, Rob suggested selling everything and moving into an RV for a year. 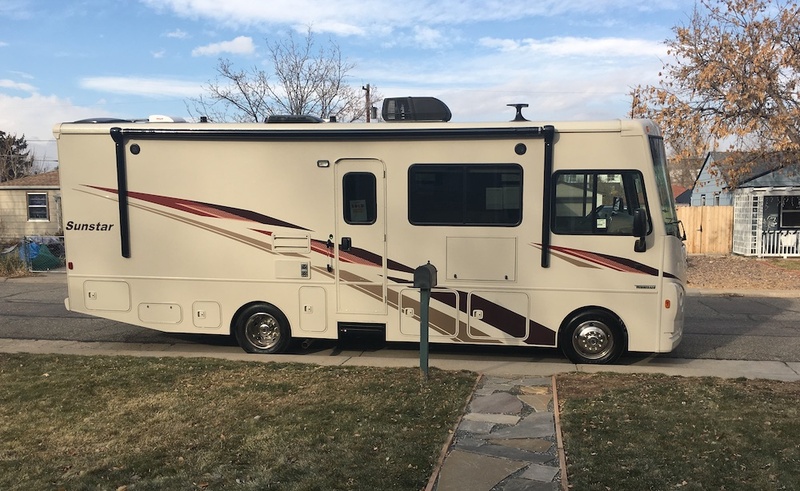 Since the Denver housing market is booming, Rob and Susanna sold their house at a big profit, allowing them to buy the RV and keep their retirement savings safe. They sold or donated most of their household items (“One place had to close for two days to process everything we gave them,” said Rob. “We had enough stuff to create six starter kitchens for refugee families coming to Colorado.) and put the rest into a 10×15-foot storage unit. “I had 45 button-down shirts. Thirty-eight hats. Why do I have all that stuff? I believe I still have half of them, because I haven’t been able to get through them. I must have had 20-plus jerseys. It’s ridiculous. You collect,” said Rob. At the start of December, they moved into their 28-foot Winnebago RV, and drove to Albuquerque, to stay with Susanna’s parents for a while. Later they’ll drive across Texas to Florida, then up along the Atlantic Coast, stopping to visit friends along the way. By fall they want to end up in Cairo, New York, to visit Rob’s parents, who owned a dairy farm there. “We are focused on our son’s life now. Time on organic farms, digging in the dirt. I want him to ride his bike. Dial down the electronics and working on becoming respectful, with more face-to-face time and learning how to do things,” said Rob. They made plans for a year, since Rafe would normally start first grade next year, but Rob and Susanna are maybe up for homeschooling. Ruth has two boys, aged 15 and 10, and one girl, 13. A part-time English as a Second Language teacher today, Ruth served in the Peace Corps in Albania and Romania right after college, and ever since I’ve known her those in college years, she’s managed to keep a broad collection of friends from every corner of the world. But then last month she decided to stop using Facebook and delete her account. Her reasons why are excellent, so let me just transcribe what she said to me on the phone recently. “They [Facebook] have the winning formula for keeping you as a customer. It’s not a normal service they’re offering. They’re selling you your own life; your emotions. You’re so invested emotionally: your pictures, recipes. Your life: it’s all there. Without it, you’re potentially throwing away anything you might see again. ‘I might not be able to find that friend again.’ They have people as captives, because people can’t break away. “But I decided to reject it anyway. I don’t like feeling trapped. In the end, I was feeling exhausted. It’s a series of pictures and it elicits emotions. You feel all these different things: nostalgia, remorse. But it’s all in your head. There’s not an actual interaction because your emotions have been played. You end up feeling exhausted. “Then, the people you’re actually with: your family. [The time you spend on Facebook is] at the expense of the people around you. You could instead take a shower, go outside, meditate, cook. It’s not relaxing. It just makes you more tired. “What will happen if I don’t do it? What will the cost be to me? But, Ruth admits she has a few advantages: Her husband doesn’t use Facebook, and all of hers and her husband’s family live within a short drive of her house. Her oldest daughter uses Instagram, but none of the kids are Facebook users. When I checked in with her, she said feels pretty good about being without Facebook or social media. For Sandra, the decision to retire at 50 was about gaining time for her many hobbies. Originally a theater major, Sandra graduated college and started working in small storefront theaters, eventually helping to run Stage Left Theater, a well-respected non-equity theater in Chicago. But she was always working a waitstaff job on the side to make ends meet, so by the time she was thirty, she’d figured out math and gone to graduate school to earn an engineering degree at University of Illinois-Chicago. Work was always satisfactory, Sanda says, but it was never really the core of her life. One of her hobbies, political activism, is how I met her over ten years ago. She is also an avid dancer, loves to read, and has a habit of walking all over Chicago, long distances. “I’m not that into [work]. It was just a day job to me,” Sandra said. Never extravagant, Sandra lives in a one-bedroom condo that she paid off years ago. She’s not married, doesn’t have kids, and managed to pay her student loans off quickly. “I have a lifestyle where I don’t care about fancy stuff. I worked at a place where I was paid well and got lots of money. I basically decided I didn’t want stuff,” so she spent a lot of time saving, rather than spending. Five years ago, Sandra decided that what she really wanted was more time for her hobbies and friends. So, like the engineer she is, she made a plan to retire at 50. Quietly, Sandra enacted her plan. The reality of it arrived about a year ago. Sandra’s firm specializes highway construction, and Sandra specialized in roadway hydrology. She was basically the person who figured out if the planned road would be able to drain water, rather than make pools you’d skid across and kill yourself from. Sandra’s firm needed her, because there really aren’t too many people that can do what she does. A one-year notice seemed about right. Right after quitting work, Sandra had some elective surgery to take care of a cartilage problem in her knee. Now she’s using her convalescence to think about what to do with all of her time – for the rest of her life. She thinks of becoming a personal financial coach. Or maybe taking a part-time job in a coffee shop just to have structure and a guarantee that she’ll talk to people on a regular basis. She has dance classes, and for summer, she’s planning walking dates with friends along Lake Michigan. More than anything, what strikes me about Rob, Ruth and Sandra is how clear minded they all seem about their choices. None of them expressed any hesitation now they’re committed to their choice, and all of them described their decision-making process as matter-of-fact. Almost to the point where they couldn’t imagine doing anything different. In retrospect, their decisions seemed obvious. So, it seems to me that while each person has circumstances that made their choice easier than it might be for others, those circumstances are no accident. There’s a kind of psychological positioning each person seemed to begin for themselves, long before they sold their house, left Facebook or took early retirement. Perhaps, it’s not the decision, or taking the big leap that’s the hard part. It’s creating a mindset to make those decisions in the first place. A movie I made 18 years ago, of a day Dad and I spent in New York City. Here he is at his best. Lou Fourcher was far from perfect, no man could ever be. But as his only child, I was showered with love, encouragement and wisdom like no other. Of course, he and I had our fights, but they were usually because of my own impatience, rather than something he did. “He was a man completely without guile or ego,” remembers his long-time friend Steve Wheatley, words that described him perfectly as a father. My mom and dad divorced when I was two. It was a sorrowful split, but friendly. Dad moved a short distance away, within walking distance in Chicago’s Hyde Park neighborhood. He gave me as much of himself as he could, with two overnights a week in his series of tiny studio and one bedroom apartments. I didn’t notice their shortcomings, because we played and played together with Legos, trips to the park and my favorite, a make-believe game called “Emergency” where I’d climb in his lap, and he’d make helicopter noises as I pretended to pilot him to find a person in need of rescue. Those years when he was single and mostly poor, bound us together as tight as you can imagine. A cerebral man who just couldn’t figure out how to make money, the 1970’s were slim for him. A big weekend outing for us would be to go to a Sunday morning matinee, which were extra cheap, and maybe to the Museum of Science and Industry for the one hundredth time, which was still free back then. 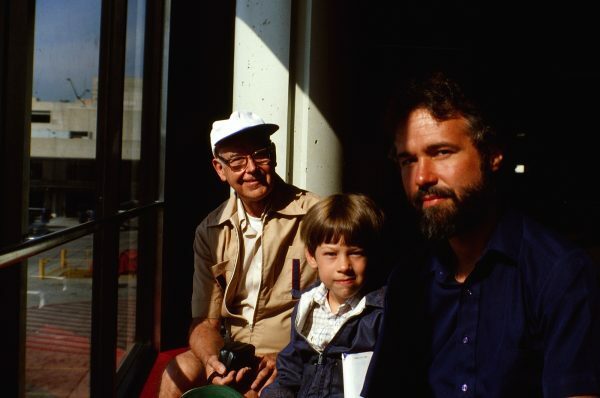 My grandfather, Charles, with me and my dad, as we waited in Logan Airport for a plane to take us home to Chicago. Probably taken by my dad. One extra slim Christmas when I was six, Dad told me he could barely afford presents, and definitely not a tree. So, in a stroke of genius, he suggested we cut out our own ornaments from magazine ads, and hang them from his rubber plant with paper clips. Topped off with a short strand of blinking multi-colored lights, I was tremendously proud of the tree my dad and I had made together. Years later, in wealthier times, we’d recall the “ornaments” with gales of laughter. We had us, and I loved it. Later, when I was eight, dad remarried, choosing a wonderful woman, Penny. She was warm and caring, with two older children of her own from a previous marriage. Dad and Penny also eventually split, sorrowfully but amicably, but for years Dad and Penny loved all us step-children, and their home became a refuge during my bumpy teenage career. Through the years, Dad, a natural athlete and one-time captain of his high school football team, gently encouraged me to get outside and play sports. A bookish kid, I resisted fiercely, but he persisted. In my pre-teens, he pulled me outside for long walks to the park with a baseball and gloves he kept to play catch. Then, one Sunday afternoon we stumbled on a pickup softball game. He pushed me to join, first volunteering himself to play. I had never played any organized sports, but that game, and the following Sunday pick-up games in that field with my dad and neighborhood kids, converted me into a baseball lover. Middle school and high school were difficult for me. Enrolled in an elite private school, and constantly told I was a smart kid, I still struggled in class and often erupted in fits of rage. The elite school setting didn’t fit me well, as I was acutely aware of the income disparity between me and much wealthier classmates. My father, and his home with Penny, was where I retreated every weekend, to prepare for the week to come. More than anything, he gave me empathy, as I’d yell, rage, cry or just sulk through my twice-a-week visits to his house. 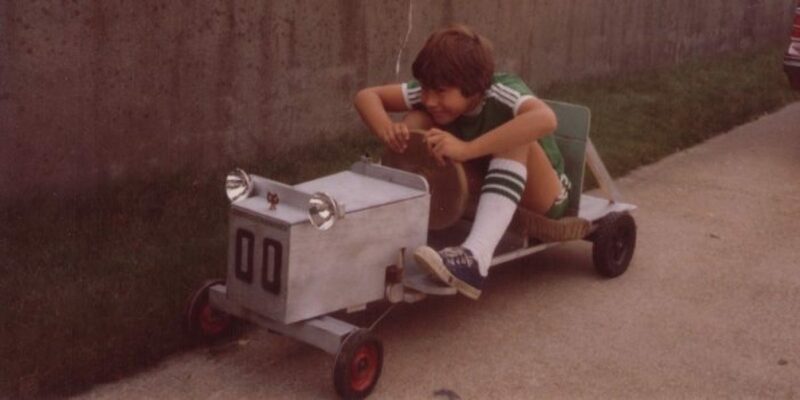 It was a relief from the pressure cooker I believed teenage-hood to be. When the weather was warm, we’d walk around Hyde Park, bouncing a ball between us on the sidewalk. I’d talk about whatever, or not, and he’d just be there. We usually ended up in the many bookstores of Hyde Park, and I’d struggle to stay entertained, as dad plunged into the philosophy, sociology or anthropology sections stocked for brainy University of Chicago students and graduates like him. “Ooh, I got some good ones,” he’d say, and I’d glance at the long, meaningless titles, wondering how he stayed awake when reading them. His bookcase was magnificent. Self-built, it was far from artful. It was just really, really big. Hundreds of books, all of which plumbed the mind, the psychology of inter-personal relations, or just something super deep and full of academic gobbledygook. He read them all, filled them with underlines and notes in the margins. The bookcase was in the same room I slept in at his house, so as I drifted asleep, I’d admire it wondering if I could ever be so well read. Noticing my interest, Dad gave me books of my own. They were often hard, always challenging. Biographies of people he thought I should know and admire. Edward R. Murrow, Saul Alinsky, George Orwell, Phil Burton, Robert Moses. The lives in those books set my mind on fire. They enabled me to dream big, and set my own course for working in Congress, starting my own news publication and believing that I could change the world for the better, just like my dad. If you knew him, you understood that Dad believed that fighting for social justice was the highest calling a person could answer. The first in his family to go to college, he found himself pulled to the civil rights movement almost immediately after leaving his small New England town. Once, as part of a group of white students who attended the historically black Morehouse College in Atlanta for a semester in 1962, and then joining Martin Luther King, Jr.’s March on Washington the next year. As a graduate student, he was part of one of the first community health centers, the University of Illinois-Chicago’s Valley Project, in 1971. That brief stint led to a stunning set of photographs he took of people living in one of Chicago’s poorest ghettos, and then a life-long passion for community health care. Although he was a practicing psychologist, Dad’s real career became managing community health centers across Chicago, most in neighborhoods devoid of investment and ignored by white society. He pulled me along to his jobs, pressing me to volunteer, where I inflicted patients with my high school Spanish, and learned about a world my elite private school barely acknowledged. 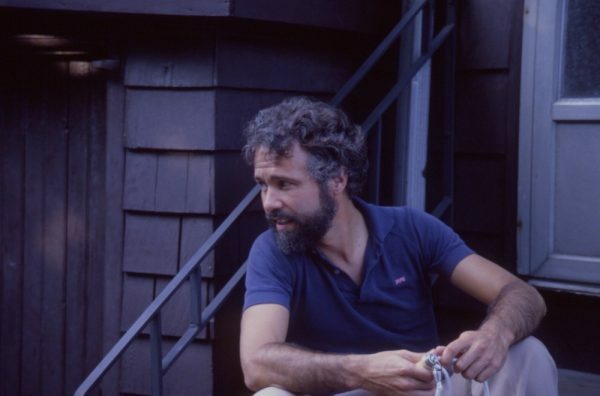 Dad, some time in the early 1990’s, on the back stoop of his sister Charlene’s house. Credit: Richard Carle. He was selfless in his commitment to work. There were plenty of people that needed much more than he could give, and they were ignored by society, he’d say. If he could make a difference, he would try to do his best. It’s a tricky thing to achieve: a drive for good works without personal ambition. It’s a standard that has eluded me throughout my own work, but one I constantly reference. Dad’s love of people, and his need to make the world better is a thread that runs through almost all of my career decisions. Dad struggled with the ravages of Alzheimer’s for a long time. The first external signs of it came almost fourteen years ago, he was diagnosed twelve years ago, and lived in a care facility over eight years. When he was able, he and I talked about his fears, and mine, constantly. I loved being his friend and confidante, it was an easy way to repay him for all the great and good things he’d done for me over the years. Like an acid test for personalities, they say that Alzheimer’s strips away the edifices, your barriers, as it progresses. For Dad, that meant he just became calmer, and more giving as the disease took away his memory. The nursing home staff told me Dad would minister to other patients, holding their hands, sitting with the anxious. Befriending the lonely. “We all love him so much,” each of his nurses said to me in turn. In a strange quirk, the nurse who admitted him eight years ago, was the one who ministered to his final hours, and pronounced him dead. “He was a great man,” she said to me as I left his room the last time last Sunday night. Dad loved jazz, played it constantly, and dragged me to Chicago Jazz Fest and Blues Fest performances. He knew the names of obscure drummers and bassists and would regale me of times he’d seen them at the old Jazz Showcase club years ago. But anyone that knew Dad well, knew him for his piano playing. Eschewing sheet music, he’d play his own songs, a unique one every time, because he claimed, he couldn’t remember anything he’d played before. But wherever he lived, most weekend afternoons, you’d find him at his stand-up piano, starting with a boogie-woogie, then a tune that transformed into a sweeping rhapsody with a repeating leit motif. His piano playing could come at any time: Waiting for people to put on jackets, venting rage from a terrible Bears game, digesting dinner. The songs were an expression of his emotion and state of being; a way to talk to anyone who could hear. Like a fingerprint, his music was unique and indescribable. But if you heard it a few times, you’d recognize four or five themes that repeated themselves. Never sad, they always ended up ranging and expansive, drawing you to imagine a vast world of many wonders. After he played for a while, he’d be relaxed, happier, ready for whatever was to come. There is so much more I would like to tell you about Lou Fourcher. The sound of his walk down the hall, his love of sly humor and his guffaw-like laughter, his love affair with Lake Michigan and bodies of water in general, the natural way he took to a picnic blanket in a patch of grass, like it was the best place in the world, no matter where it might be. His radiant intelligence that was somehow never cutting, but instead managed to fold you in. I have anticipated writing this memorial essay for years. And to finish it, I feel like I am letting go of him just that much more. Feeling the beauty and love that was my father, slip away from me. It is so hard to stop writing. Sitting at his piano bench, playing that piano with the funky A key he could never get fixed, is how I’ll remember Dad forever. I am so grateful he was my father. If you read this in time, and remember him, please join us at his open memorial service, Sunday, January 27 at 2:30 p.m., at The First Unitarian Church of Chicago, 5650 S. Woodlawn Ave. Dad was also a huge fan of Ruth Rothstein, with whom he worked to help make Erie Family Health Center one of first health centers to apply Medicaid funding to treating AIDS patients. So, in lieu of flowers, please consider making a contribution to The CORE Foundation, 312-572-4549, 2020 W. Harrison St., Chicago, IL 60624, which benefits the Ruth M. Rothstein CORE Center, a clinic that focuses on the prevention, care and research of HIV/AIDS and other infectious diseases.